here i want to show you a nice and elegant method for logging, It´s only one of a various number of possible ways which you can easily extend even more. Herefore we use a little Powershell trick that overrides the cmdlet. When Powershell tries to resolve this command it will first try to find a function in your code. Here we add our logging methods and invoke the actual function. Sounds hard? nope. 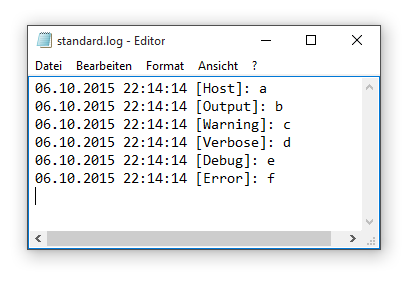 Now you can just type your outputs as by Write-anything and the logging will be done at the same time. To load the extension you have to import the script – you should also set the logging path. In this example the name of the variable herefore is $WriteLogFilePath.